Hello friends and welcome to the Final Fantasy XV: A New Empire Guide. This guide is designed to help you understand the game mechanics and further yourself within the game itself. 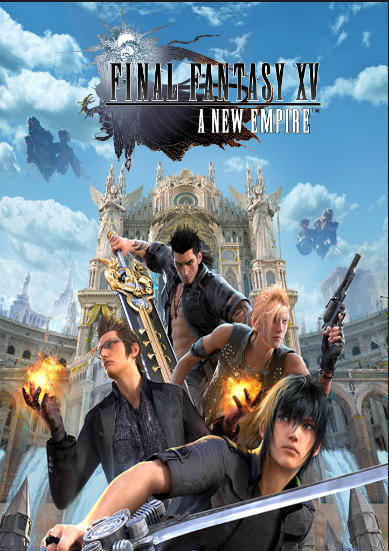 Final Fantasy XV: A New Empire is an interesting game to have the Final Fantasy name tacked onto. 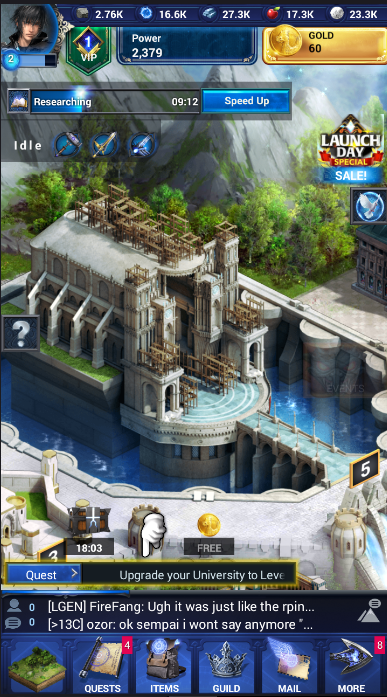 A New Empire is a game very similar to games like Mobile Strike. The main function of the game is having your own personal empire that you constantly build up and upgrade to making better. Your empire is filled with several different buildings, plots for farms and and energy, and so much more. At the start of the game you are taken through a small tutorial that pretty much sets up your empire in the beginning. You follow through it and you’ll be upgrading and building parts of your empire very quickly as it teaches you how to do so. Afterwards you’re left on your own to build your empire how you want and this is when the games biggest mechanic comes in and that mechanic is waiting. A major part of this game is waiting and that’s just something everyone is gonna have to deal with. On every upgrade, building, or almost anything you do in this game it has a timer. And when the timer runs out the upgrade or build will be done. In some cases you can speed up the timer entirely for free but in most you have to speed it up with one of the games currency’s. The game itself is designed to make you wait like this so you go and do other stuff within the game while you’re waiting on your build or upgrade. Once you’re through the tutorial you want to make sure your empire is built to the current state you want it to be. A good way to do this is follow the quest suggestion on the screen. Each quest pretty much tells you to build or upgrade a building to a certain level and it’s actually smart to go by the quests. It’s a simple guide line that helps you get further in the game and doesn’t make you feel as lost as you could be in a game like this. By following the quests eventually your empire is going to be built and leveled up rather nicely. At this point it’s probably where you’re gonna have to start paying more for speed ups and waiting more. When it comes to this is when you can start attacking other empires. Though when I say attacking its really another form of the games waiting mechanic. In A New Empire you’re whole purpose is to build up your empire so it can be strong to withstand other players attacks. 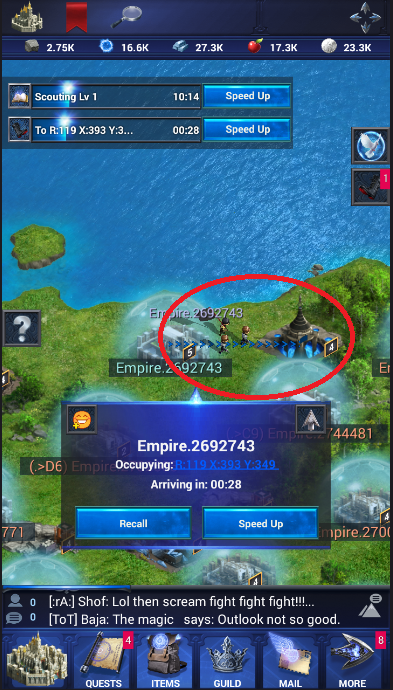 While at the same time you are building up an army of units from your Barracks in order to attack other empires. Attacking is done through a mechanic known as March in A New Empire. When you March you choose which units are going to be Marching on an empire and how many are going to go. When you’ve gotten your units decided and you march they go off on their own to the selected Empire and they attack it. And that’s honestly pretty much it when it comes to marching. Your troops go off on their own then you wait for them to attack, survive, and return with resources and other items from their victory. There isn’t any really hands on function when it comes to marching you’re really just playing the King role. You sit within the empire and keep it building and progressing through out the game. And while you sit in the empire you let your troops go on their own and wait for them to return with good news. Aside from attacking other Empires there are spaces on the map that can be Occupied. Occupying a space basically means after a certain amount of time your troops take over that space and you get resources depending on what space was occupied. There are also monsters set out through the field that you can attack as well. Slaying monsters gives you bonuses and resources but you have to be a in a guild before you can attack monsters. There really isn’t much more to say about the game play of A New Empire. It’s all very simple and easy to understand. The biggest tip I could give is just get proficient at being patient. Everything in this game revolves around waiting whether it’s building and upgrading or having your units attack or occupy spaces. It’s all waiting and not much real time strategy is needed to become good at building your empire and taking over other players empires. Just following along the quests given and build your empire accordingly. Then from there once you see good openings with nearby empires send your troops out to them and attack. It’s never a bad idea to Scout either which can be researched at the university so you can put some time into that as well.